The Newsboys Foundation Youth Leadership Award, in partnership with VicSRC, recognises an exceptional student leader in Victoria. The 2018 Newsboys Foundation Youth Leadership Award was won by Whitney Eadon from Bendigo Senior Secondary College. The finalists for the 2018 Newsboys Foundation Youth Leadership Award were Tiffany Yang from Mount Waverley Secondary College and Ned De Grandi from St Josephs College Geelong. More information about Whitney Eadon’s win can be found on the Student Voice Hub. Check out the VicSRC Student Voice Awards 2018 wrap up. 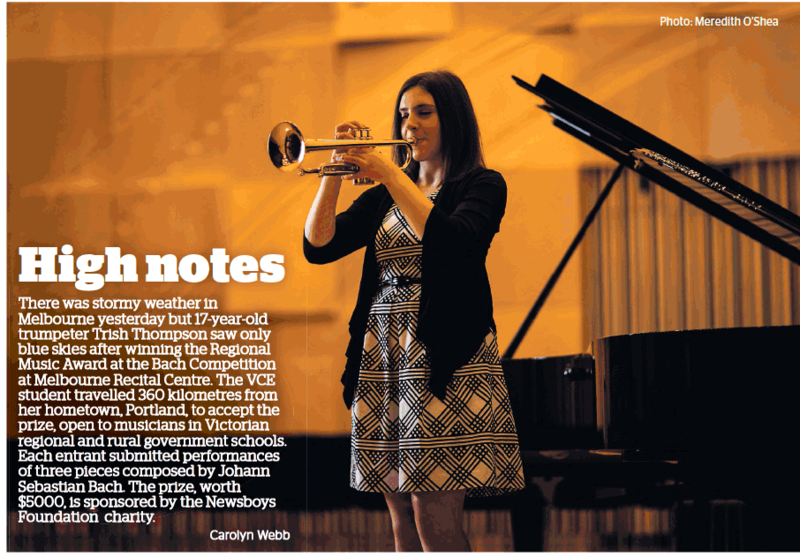 Seventeen-year-old trumpeter Trish Thompson was featured in The Age print edition (on 18 June) after winning the 2018 Newsboys Foundation Regional Music Award in the Bach Competition at the Melbourne Recital Centre. The Newsboys Foundation Awards aim to recognise young people’s potential and nurture their capabilities and talents. The awards also build young people’s confidence by providing new experiences and opportunities to meet and interact with established leaders. The Newsboys Foundation Youth Leadership Award, was launched in 2013 to celebrate 120 years of Newsboys. Following on from the success of this award, the Newsboys Foundation Regional Music Award was launched in 2015. The Newsboys Foundation Regional Music Award, in partnership with the Melbourne Recital Centre, is part of the MRC’s annual Bach Competition. The award seeks to address some of the issues affecting music students who live in regional areas, including working in isolation and the added challenges associated with accessing learning opportunities. Winning the award involves travel and one week’s accommodation for the student and a parent/guardian in Melbourne, a daily per diem allowance; lessons with a top teacher on the relevant instrument; complimentary tickets to concerts at Melbourne Recital Centre during that week, mentoring/shadowing opportunities with Melbourne Recital Centre’s artistic and production staff, and the opportunity to go ‘behind-the-scenes’, providing direct contact with industry professionals. The Newsboys Foundation Regional Music Award is open to entrants who are 17 years of age and under (at 1 January in the year of the award) who live in rural or regional Victoria and attend a Victorian Government school. A minimum performance level of AMEB Grade 5 or equivalent is expected. Competition repertoire will consist of any works of JS Bach not exceeding 10 minutes in total duration. Please download the competition guidelines for further application information. The judging panel of the Melbourne Recital Centre Bach Competition presents the Newsboys Foundation Regional Music Award prize to the most outstanding finalist from regional or rural Victoria. Each year, the Newsboys Foundation Regional Music Award is presented at the Melbourne Recital Centre Bach Competition Final. This event is free and seating is not allocated, however tickets are required for entry. 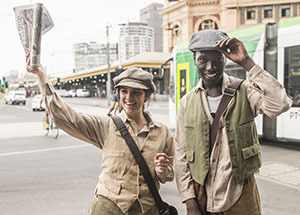 The Newsboys Foundation Youth Leadership Award, in partnership with VicSRC (Victorian Student Representative Council), recognises an exceptional student leader in Victoria. VicSRC is the peak body representing school students in Victoria. Each year, VicSRC presents its Student Voice Awards to recognise the outstanding work of individual students, schools and teachers. The Newsboys Foundation Youth Leadership Award is part of the Student Voice Awards and recognises the leadership achievements and the future leadership potential of a Year 12 student in Victoria. The award winner receives a $3,000 grant for extending and developing leadership skills and activities. Two finalists each receive $1,000 to extend and develop their leadership skills and activities. The Newsboys Foundation Youth Leadership Awards is awarded to a Year 12 student who provides exceptional leadership within their school and community. Three finalists are selected and are interviewed for the Newsboys Foundation Youth Leadership Award. Interviews will be held on a date to be advised. The Newsboys Foundation Youth Leadership Award is judged by the VicSRC Student Voice Awards Judging Panel and includes student representatives from the VicSRC Executive, the VicSRC Executive Officer, the Newsboys Foundation CEO and a Director of the Newsboys Foundation. The Newsboys Foundation Youth Leadership Award is announced in October each year as part of the VicSRC Student Voice Awards. Please donate to the Newsboys Foundation Trust to help support young people in Victoria who are experiencing disadvantage. We are working hard to ensure all young Victorians have the opportunity to reach their full potential. Your donation will truly make a difference in the lives of so many young people. All donations over $2.00 are tax deductible. Thank you for your support! Acceptance of any contribution, gift or grant is at the discretion of Newsboys Foundation. Newsboys Foundation will not accept any gift unless it can be used or expended consistently with the purpose and mission of Newsboys Foundation. All donations over $2 are tax deductible. Otherwise, Newsboys Foundation refrains from providing advice about the tax or other treatment of gifts and will encourage donors to seek guidance from their own professional advisers to assist them in the process of making their donation. The Newsboys Foundation will accept donations of cash or publicly traded securities. Certain other gifts, real property, personal property, in-kind gifts, non-liquid securities, and contributions whose sources are not transparent or whose use is restricted in some manner, must be reviewed prior to acceptance due to the special obligations raised or liabilities they may pose for Newsboys Foundation. Newsboys Foundation will respect the intent of the donor relating to gifts for restricted purposes and those relating to the desire to remain anonymous. With respect to anonymous gifts, Newsboys Foundation will restrict information about the donor to only those staff members, Board Directors, associates and contractors with a need to know. Newsboys Foundation will not compensate, whether through commissions, finders' fees, or other means, any third party for directing a gift or a donor to Newsboys Foundation.